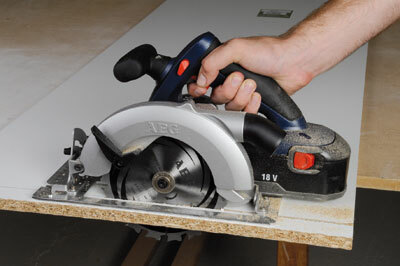 It's easy to be overwhelmed by even a low quality circular saw when you first start using them: the power at your disposal is something fierce, and it's easy to be happy with the product without really considering where improvements could be made. AEG have put careful thought into their current take on the tool, so while yes, there's a huge amount of power on offer, it's the little details that really catch your eye. For starters, the tool is incredibly well balanced: it feels safe in the hands, and isn't weighted too far in any one direction, so you're controlling the blade rather than being dragged along. At 3.8kg, too, it's got some clout without being uncomfortably heavy. Aluminium guards keep you safe, along with the electronic motor brake, which brings things to an effective halt. Obviously there's a safety swtich too, to prevent any fierce mishaps, and the handles themselves are moulded comfortably under your hands, so you can wield everything effectively. 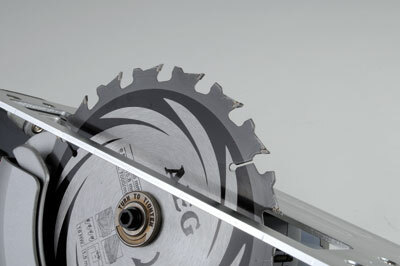 The 165mm blade can tackle angles of up to 50 degrees for bevel cutting, and because it's easy to line up and see the cut you're making, you actually have a significantly impressive degree of accuracy at your disposal. Coupled with the superior control of the model itself, we found the BKS 18 to be a great no-fuss saw, providing controllable rather than intimidating force. 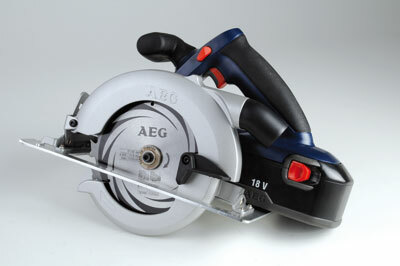 Circular saws in general are excellent to have to hand, and because AEG's take makes you feel that much more confident, you're likely to get a lot of solid use out of this model. "You are likely to get a lot of solid use out of this model"